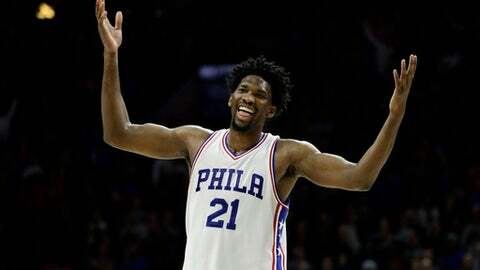 NEW ORLEANS (AP) Philadelphia center Joel Embiid will not participate in the Rising Stars Challenge or the Skills Challenge at All-Star weekend in New Orleans because of an injured left knee. Oklahoma City’s Alex Abrines will replace Embiid on the World Team for Friday night’s Rising Stars game. Denver’s Nikola Jokic will take Embiid’s spot in the Skills Challenge on Saturday night. The NBA announced the Embiid replacements Wednesday, the same day that it chose New York’s Willy Hernangomez to replace Denver’s Emmanuel Mudiay in the Rising Stars game. Mudiay has a back injury. The league has not yet announced who will replace injured Cleveland forward Kevin Love on the Eastern Conference roster for Sunday’s All-Star Game. Love had knee surgery earlier this week and is expected to be sidelined for several weeks.